Fake Phily Jesus has been arrested after performing one of his signature moves – walking on water – and it proved as much of a hit in Philadelphia’s Love Park as it was in the Gospel of Matthew. Except for police, of course, who say he’s not the Messiah… he’s a very naughty boy. ‘Philly Jesus’ – aka Philadelphia street performer Michael Grant – performs Christ-like stunts in the park every day – walking on water in the park’s fountains, and occasionally baptising people. So when a policemen arrested the popular local figure for disorderly conduct when he refused to leave the park, ‘Philly Jesus’ had no shortage of disciples to help out. Philly Jesu2s.jpg He’s something of a celebrity in Philadelphia’s iconic LOVE Park – the Pennsylvanian capital’s answer to Times Square’s Naked Cowboy, or so they say. 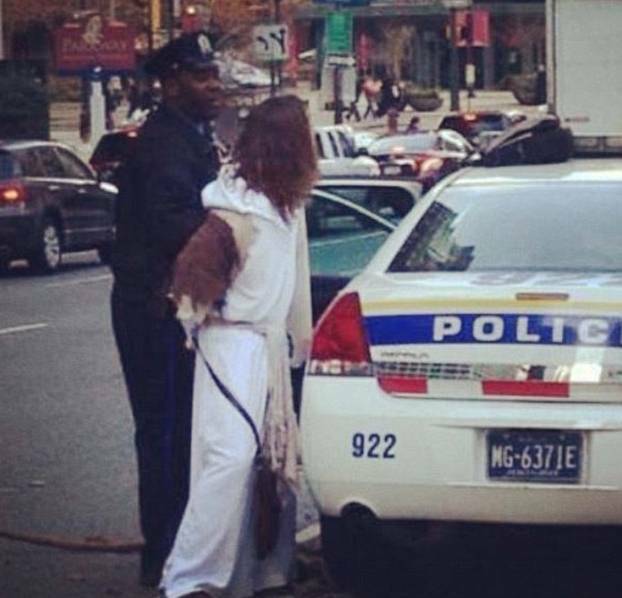 But the city’s much-loved ‘Philly Jesus’ – a daily fixture famous for his attempts to walk on water in the park’s fountains and even baptize people – was arrested on Friday for disorderly conduct and failure to disperse, sparking outrage among his many admirers. The performer claims that the heavy-handed policeman threatened to ‘f*** him up’ – not exactly an appropriate thing to say to the fake risen Christ. Hundreds of online protests have now sprung up with the hashtag #FreePhillyJesus, campaigning to have Grant’s charges dropped. Phily Jesus is a recovering drug addict, but says he does not panhandle in the park – he just spreads God’s message via the medium of splashing about in fountains. Arrested for walking on water or because he is fake? when dd he do that? So now we are arresting deities ? !